Action from Saturday's derby clash at Duncansfield. Cumbernauld United earned bragging rights with their 4-1 win over Kilsyth Rangers in Saturday’s derby clash at Duncansfield. The convincing win confirmed John Queen’s side have bounced back from a nightmare start to their Super League First Division campaign. The Guy’s Meadow side were heavily beaten by Maybole and Clydebank, shipping five goals in each, in their opening two matches. 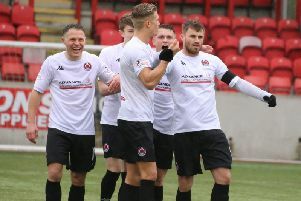 But since then they have racked up six wins in seven league and cup games, propelling into the promotion race and through to the next round of both the Scottish Junior Cup and West of Scotland Cup. They have been particularly free-scoring away from home. Saturday’s win at Kilsyth was their fifth in succession on the road and in those games they have scored no fewer than 26 goals. But despite the improvement in his side’s fortunes manager Queen insists he’s not getting carried away - and admitted he seriously thought about quitting before the season began. He said: “We had a complete upheaval during the summer when we virtually lost a whole team. It was the worst summer of my junior career and I definitely thought about walking away. “But I didn’t and I am pleased - though probably more surprised - at how quickly we’ve managed to turn things around. On the derby win at Kilsyth Queen added: “I was absolutely delighted and thought it was thoroughly deserved. “We also missed a penalty so we could have won by more. But we’re not getting carried away. I said at the start of the season that consolidation had to be our aim and that’s still the case. United are at home to Kilwinning Rangers on Saturday.